Breast thermography is one of the best early warning screenings available today. As part of a woman's annual health screening, it is safe for women of all ages. It is particularly useful for women who tend to have dense breast tissue or larger breasts. It is effective for women who have undergone mastectomy, have implants, or have had surgical reductions of the breast. It is also safe for use by pregnant or nursing women. Breast thermography is able to screen hard to reach areas such as arm pits and upper chest area. Once a breast baseline image is established, Thermologists will be able to detect physiological changes over time. A Thermography breast screening includes 5 images: One front view, two side views, and two oblique views. These views cover the entire chest, underarm and lymph areas. All scans are done in complete privacy and take approximately 30 minutes. Two screenings, 3 months apart, establish an initial thermal baseline. This baseline is used for all future analysis. The key to annual breast health screening is to monitor for change over time. According to the American Cancer Society, statistics indicate that 15% of all breast cancers occur between the ages of 20 and 44. Breast cancers in younger women are usually more aggressive and have poorer survival rates. Thermography offers younger woman a valuable tool to add to their regular breast health checkups with baseline imaging beginning at the age of 25. Use of this safe, radiation free screening method will increase chances of detecting breast cancer at an early stage. A thermogram can detect neo-angiogenesis, the growth of new blood vessels that develop to deliver glucose and other nutrients to support multiplying cancer cells. This will show up as a higher temperature in breast tissue as many as 8-10 years before it can be detected by mammogram. When thermography is added to a woman's regular breast health checkup, a 61% increase in survival rate has been realized. When used as part of a multimodal approach, 95% of early-stage cancers have been shown to be detected. 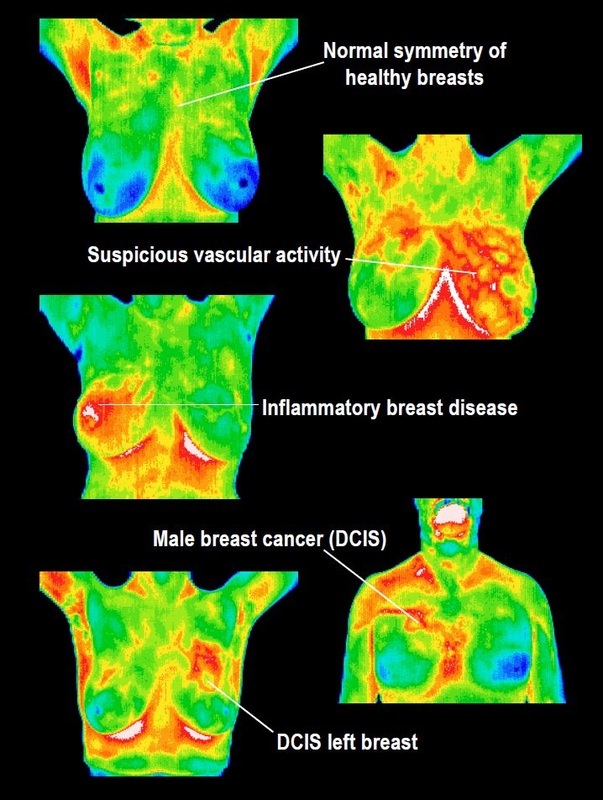 This makes thermography a valuable screening tool in the prevention and early detection of breast cancer. Inflammatory breast cancer (IBC) is a rare and very aggressive disease in which cancer cells block lymph vessels in the skin of the breast. This type of breast cancer is called "inflammatory" because the breast often looks swollen and red, or "inflamed" (American Cancer Institute). According to the National Cancer Institute, inflammatory breast cancer accounts for 1 to 5 percent of all breast cancers diagnosed in the United States. Most inflammatory breast cancers are invasive ductal carcinomas, which means they develop from cells that line the milk ducts of the breast and then spread beyond the ducts. Inflammatory breast cancer progresses rapidly, often in a matter of weeks or months. Its aggressive nature makes early detection critical. Inflammatory breast cancer is not usually detected by ultrasound or mammograms until it has reached stage III or IV. 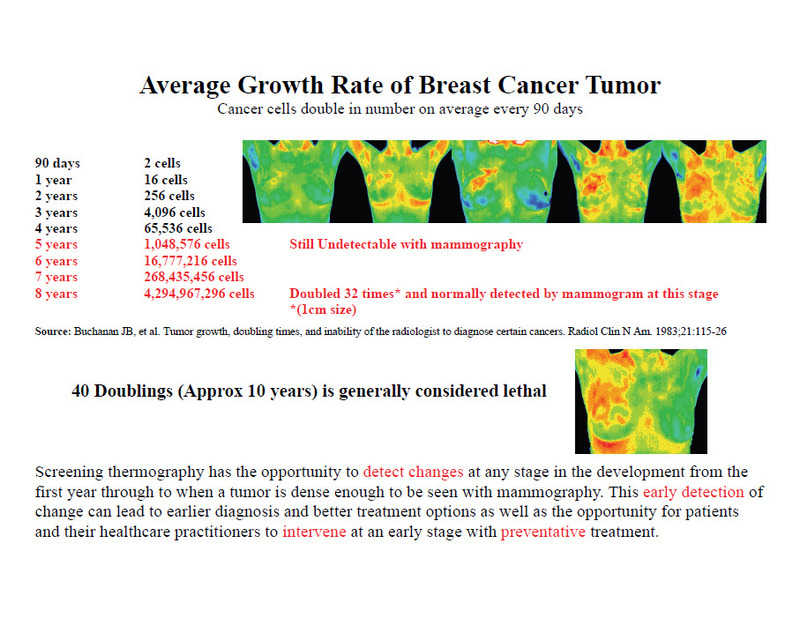 Thermography is a valuable screening tool in the early detection of IBC. Pictured is a thermogram of a woman with IBC who had no symptoms of the disease. Breast tissue is composed of connective tissue (dense tissue) and fatty tissue (non-dense tissue). When a woman's breast is composed of more connective tissue and less fat, she is considered to have dense breasts and is at greater risk for developing breast cancer. Dense breast tissue makes it more difficult for mammography to pick up suspicious lesions. In the mammogram picture on the left, you can clearly see the tumor present. However, in the picture on the right, it is impossible to detect the tumor due to the presence of dense breast tissue. Thermography is a valuable screening that can detect physiological changes, even in dense breast tissue. This test can provide a clinical marker to the doctor that a specific area of the breast needs particularly close attention.